There are addition devices that can be used to make a contactless payment such as key fobs Smart Cards and others including Smartphones. However, in this section we have covered payments made when using a card that has contactless payment technology. There are no additional fees for using the contactless payment card however standard fees and charges may be applied. Designed for the smaller payments with the average being £8.97 in in the third quarter of 2016. Up from £7.12 in the same period in 2015. It is also claimed that 21% of card payments made were done so using contactless payment technology, this accounted for just over 1 in 5 transactions. When they first arrived, some people were concerned that they might make multiple payments for the same item. With the contactless payment card, each transaction has to be completed or void before the next one. This system has been put in place as a safeguard. Contactless is not set up to be used at a ATM. At an ATM you will need to insert your card and input the pin number in the usual manner and the same applies for cash back. This is also not available on contactless currently. However, the card can be used to make a standard Chip and PIN transaction If you wish to receive cash back. How does a contactless payment card work? 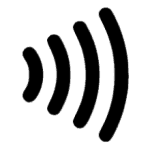 Contactless debit and contactless credit cards have a small chip in them, this emits radio waves. So, to pay for something using this system you hold the card near a payment terminal this will pick up a signal and processes the transaction. The reader will introduce itself’ to the card, once the card recognises the reader it will then reply with the required coded data. Contactless cards have a number of security features. These range from a payment limit which is generally around £30 on a single transaction, to a limited number of uses before the customer is asked for their pin. Safety is important as a card may look like a simple piece of plastic, and uncomplicated, but it holds a great deal more than it appears on the outside. So, we would suggest checking your statements, you should do this on a regular basis, when using contactless don’t feel that you can’t ask for a receipt. People are finding that receipts are not offered when using contactless. Not all merchants will, however they can very easily supply you with one. Ready to start accepting contactless payments? Click here and answer a few questions to enable us to find you the best contactless payment provider for your business. If you prefer you can call us on 0333 305 4500 to discuss further on how we can help you start accepting contactless payments.